"The Happiest Mayor in the World"
Shop is located at 6400 South Eastern #4 (Park 2000), Las Vegas, NV 89119 PLEASE call or email to set up an appointment before coming to the shop. All costumes are custom fit and styled to each individual preference and we are NOT open to the public. We only rent high end complete costumes. We will custom style or fit your costume and deliver to every major hotel in town if you don't have to to leave that poker machine or meeting. Email or call us to see if we have what you are looking for. Original fashion, era, and production costumes for balls, parties, conventions, promotions, weddings, special events, halloween, or a night on the town. 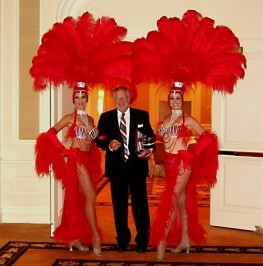 Our lightweight Las Vegas showgirl costumes are designed and handcrafted in our newly expanded shop in Las Vegas using the finest ostrich feathers. Show-Off! Productions is the only full-service costume rental boutique in Las Vegas, with head to toe custom designs, personal fittings & delivery. It's a fine line between fashion and costume at Show-Off! Productions. Call for an appointment (702-739-6995) or email your special request. We just love those custom projects for conventions, weddings, and other special events. If we don't have it, we'll make it, and we'll make it to fit. Ours are not the pre-packaged dime-store costumes that you find everywhere else. Although we have some high quality manufactured pieces, most of our costumes are custom designed and hand made with care and attention to detail on our premises in Las Vegas. From the feather in your hat to the rubies in your shoes, we provide everything you need - clean, pressed, and personally fitted. Want to outfit your conventioneers with 50 Elvis costumes? 50 Caesars and Cleopatras? 50 gangsters and flappers? Call us at any decent hour PST. (702) 739-6995. Or drop us an email. and we will email you the photo(s) you request. We have too many costumes to list or picture here and we design rentals to order. Once we know your event date and costume size(s), we can provide photos or sketches of the costumes you're looking for. Please call or email to set up an appointment. Don't be shy. We take appointments seven days a week. We are a 5-minute taxi ride from the South Strip and the McCarran International Airport. Just say "The costume shop in Park 2000 at Sunset and Eastern." We will custom design or fit your costume and we deliver to every major hotel in town.